Timothy Hunter hopes Vermeer would be pleased. Johannes Vermeer’s 17th century oil on canvas, Girl With a Pearl Earring, shows the left side of a Caucasian girl’s face, wearing one pearl earring. Hunter’s oil painting, Girl with Two Pearl Earrings, shows the right side of an African-American woman’s face, showing an ear with two pearl earrings. Hunter looks for imperfections in faces. 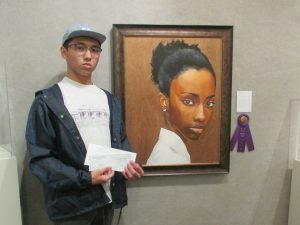 Then he captures them on canvas and voila – his work wins awards, such as the Best in Show at the Franklin G. Burroughs – Simeon B. Chapin Art Museum’s Horry-Georgetown County High Schools 18th Annual Juried Art Exhibition. Hunter is about to graduate form the Academy for the Art, Science and Technology, leaving behind the epitome of a young artist in the making. Hunter’s style right now is precise – most of his works are portraits of African Americans. What is beautiful to him, Hunter says, are the imperfections in people’s features. One of Hunter’s larger pieces is a portrait of Brazilian model Ana Flavia. He liked her story, and tells that she was working retail in a small when she was approached to model. She had to borrow a pair of high heels form a friend for the audition and now she’s a supermodel. “She has an Afro and her face isn’t symmetrical,” he says, explaining what’s interesting to him about painting her. When it comes to the lack of symmetry, Hunter is an expert. One side of his hair is close-cut black and the other is longish wavy blonde. Hunter and his father, also named Timothy Hunter, his mother Maria Baens, and his younger siblings Paul and Isabella, live in Briarcliffe. His father is a physician at Beach Urgent Care in Myrtle Beach and his mother is a physician at Doctor’s Care in Carolina Forest. Along with his parents, his Aunt Rita, he credits his teachers, Jamie Franklin and Rick Spivey, and even his art classroom for his talent. “This room is the reason I’m as good as I am,” he says about the art studio at the Academy for the Arts, Science and Technology. Hunter also earned an honorable mention in the South Carolina State Fair Jr. Art Competition in 2015 and 2016, took Best in Show at the YAM Eastern Regional Competition in 2017 and second place in Art Fields Junior Competition in Lake City in 2017. Hunter was raised to appreciate art, and was taken to art museums wherever the family vacationed. He’s always drawn, using pencils, pens and markers until his Aunt Rita gave him a set of oil paints for Christmas his sophomore year. Even then, they sat on a shelf for months until an art project at school inspired him to use them. “It clicked and I felt like I understood oils very well,” he says. “He’s found a niche and he has the potential for that to be just the beginning for him,” Franklin says. What he wants for himself is to live in New York City, making a living as an artist. But, just in case…when he studies at the College of Charleston, he will double major in chemistry and fine art. When he’s not painting, Hunter surfs, and when he’s not doing either of those things, he’s photographing abandoned buildings. Does he think Vermeer would approve of his Girl with Two Pearl Earrings?